Fine cover commemorating the Apollo–Soyuz mission. 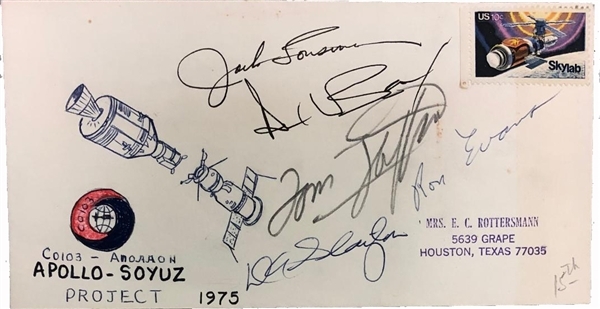 The cover is dated1975 with a hand drawn cachet of the Apollon-Soyuz signed by the American Apollo astronauts, Thomas P. Stafford,Donald “Deke” Slayton, Alan Bean, Ronald E. Evans, Jack R. Lousma. With LOA by Zarelli. Apollo–Soyuz Test Project (ASTP Apollon-Soyuz, lit. "Experimental flight Apollo-Soyuz", commonly referred to by the Soviets as "Soyuz-Apollo"), conducted in July 1975, was the first joint U.S.–Soviet space flight, as a symbol of the policy of détente that the two superpowers were pursuing at the time. It involved the docking of an Apollo Command/Service Module with the Soviet Soyuz 19. The unnumbered Apollo vehicle was a surplus from the terminated Apollo program and the last one to fly. The mission included both joint and separate scientific experiments (including an engineered eclipse of the Sun by Apollo to allow Soyuz to take photographs of the solar corona), and provided useful engineering experience for future joint US–Russian space flights, such as the Shuttle–Mir Program and the International Space Station.